You are here: Home / Gluten Free Finds / Genius! 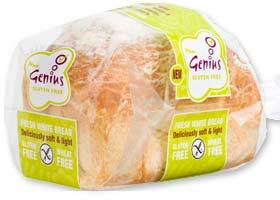 Have you tried the new Genius bread available here in the UK yet? It’s been available for a couple of weeks now, but you do have to be lucky enough to have a Tesco near you that stocks it. My daughter is really enjoying it (so much so that we had to make another supermarket dash this morning). It is really very like ‘normal’ bread, and the brown has a nice malty taste. It is also not crumbly, and makes a good sandwich. Disadvantages: it is expensive, no doubt about that. 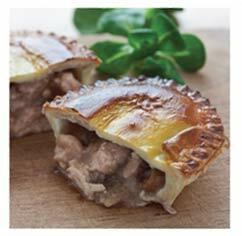 It is currently £1.99 during the introductory period, and will be going up to £2.49 in a month. Also, the brown loaf we had last week had an uncooked section but, as we all know, that sometimes happens to ‘normal’ bread too. I have asked Genius whether they were hoping to get it on the prescribables list, but haven’t had an answer yet. If I get one, I’ll let you know. Tesco are currently the only place that have it – I do hope that changes! – and they seem to have a stocking problem. After finding the first (brown) loaf, I went back to buy more, only to find that all five loaves on the shelf were out-dated. I took one to customer services, to ask when more would be arriving, only to find that because there were still five on the shelf, the computer thought they were still in stock, so hadn’t ordered any more – and because the ones on the shelf were past their sell-by, Tesco wouldn’t sell one to me … Husband thought I should have asked them to give it to me instead of selling it! We went to a very large Tesco specially this morning, and found one Genius loaf left – a white one – and not even in the right place on the shelf. So we grabbed it – if you were out scouring the northwest of England for a Genius loaf this morning, sorry! For more information on Genius, visit their site at Genius Gluten-free. This site is very interesting to those of us from the US. I like to see the differences in the healthcare systems, and the gluten free products available. This bread is beautiful, as are the others on the Genius site. I just wish I could taste it! Thank you for your post about Genius bread. From our research, our understanding was that people with coeliac disease tended to find the whole prescription experience quite cumbersome and painful and that they wanted to see great fresh gluten free products on the shelves of the supermarkets where they do the rest of their shopping. So that’s where our efforts have been concentrated. That said, we simply want our bread to be available to you, but unfortunately it’s not a quick and easy process to become an NHS supplier. Thanks for explaining that. I know it isn’t easy to supply the NHS (or Tesco, for that matter) but at least it should be easier to find at Tesco. Turns out the first loaves I bought at our local Tesco were there by mistake (a shipping error – we’re too small to qualify for Genius bread). I chatted to the very helpful stock manager, so with luck, I’ll be able to find them there again. Fingers crossed! Yes, they’re there! Stocked with the ‘normal’ bread, so I had to ask whether the Genius bread was in yet, because it didn’t occur to me to look in the ‘normal’ bread aisle. But the loaves are there, both brown and white. Love the Genius bread too. Has anyone tried freezing it yet, I have just bought a white and a brown, sliced them (thickly for toast) and frozen half of each loaf – I’ll let you know how they go – it would just mean less trips to Tesco just for bread if it works. Good idea – it’s not lasting very long here! And probably worth stocking up before the price goes back up again. My mum loves this bread but going through it too quick for my liking as it means i have to go to all our Tesco’s till ive found some,and i’ve never been lucky to find it at £1.99 always paid full price, but well worth it. i did enquire at the customer care number to see if it was freeze able and they said yes. which was good news. One loaf doesn’t last long, does it? We’ve decided we like the brown one best. Hi Glenys – I know what you mean. My concern is that this might only be available for a short time… supermarkets only stock products that sell well, and are inclined to drop things from their list. Still, we should enjoy it while it’s there! I ONLY KNOW ABOUT BREAD WHAT ARE THEY GETTING IN US THAT IM NOT GETTING?? Glenys, I don’t think that gluten free goods are available on prescription in the same way that they are here, but I think there are a number of excellent products available in America that we don’t have, such as quinoa pasta from Ancient Harvest, which my daughter really enjoyed when we were visiting. Have just come across Genius bread while on holiday in Swansea, where Tesco stocks it. As a coeliac, best I’ve tasted: doesn’t crumble to bits and doesn’t turn into the consistency of cardboard when used for sandwiches. Really like the brown – hope more store begin to stock it and better still that it gets on to the NHS list. Hi Peter. As a non-coeliac, I think its the best gluten free British-style bread I’ve tasted too! The brown is very good. I like the Proceli French-style baguettes as well, though. I’ve just heard that GFF Direct are now stocking Genius bread (brown and white) and it is available from them by mail order or via their website. 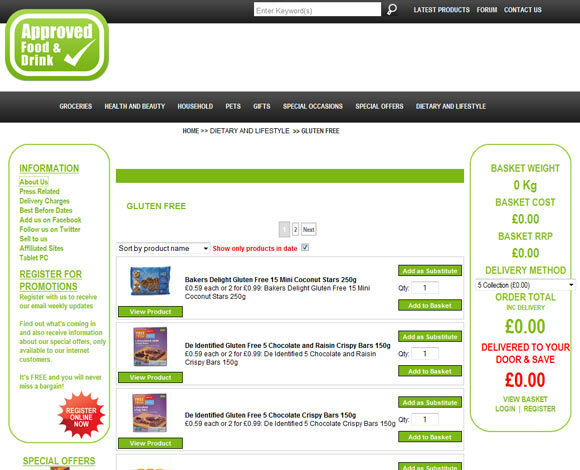 Here’s the direct link to the GFF Direct Genius Brown Bread page. Sainsburys are also stocking the genius bread. Cheaper than you found it. It is beautiful and i would reccommend it to anyone. Hi Emma – I shall have to look out for that. Thanks for letting us know. Love this bread and agree with all comments. To Joan who gets hers on prescription, what reference number does your GP use to get it on prescription? genius bread is fantastic compared to other gluton free bread, when can I get it on prescription? According to the latest from Genius, the NHS has not yet approved Genius for prescription – but Genius are working on it. I think it’s quite difficult to get onto the prescribables list; let’s hope that Genius manage it soon. you are definately what it says on the packet! you have changed my (eating) life around. 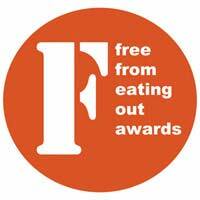 after being diagnosed as gluten intolerant 6 years ago I have had to live without a decent sandwich. However, during a picnic for my hen do my friend produced one of your white loaves and I was ecstatic as was my other friend who is also a coeliac! imagine our suprise when we also discovered that there was a wholemeal loaf to start on too!!! words cannot describe how happy I was that day, and not all because I was getting married. Thanks for changing my lunch times into something pleasurable again. I can suddenly enjoy a piece of toast, a bacon butty and my parents even keep a loaf in their freezer for when I turn up so I too can eat. all your products are fab!!! Congratulations Genius. Your Genius BLOOMER is the BEST. Finally, I can eat and enjoy any sandwich, make croutons,mini pizzas. The BLOOMER has made life so much easier. I want to shout it from the roof tops.